Just a few weeks ago, Houston political observers were predicting state Sen. Sylvia Garcia would easily win the Democratic primary to replace U.S. Rep. Gene Green. Then Tahir Javed pledged to “spend whatever it takes" to come out on top. Now a state senator, Garcia is running for Congress again and, until recently, some in Houston were predicting she would effectively swamp the other six Democrats in the race, winning the party's nomination in a clear shot on the March 6 primary and avoiding a runoff. 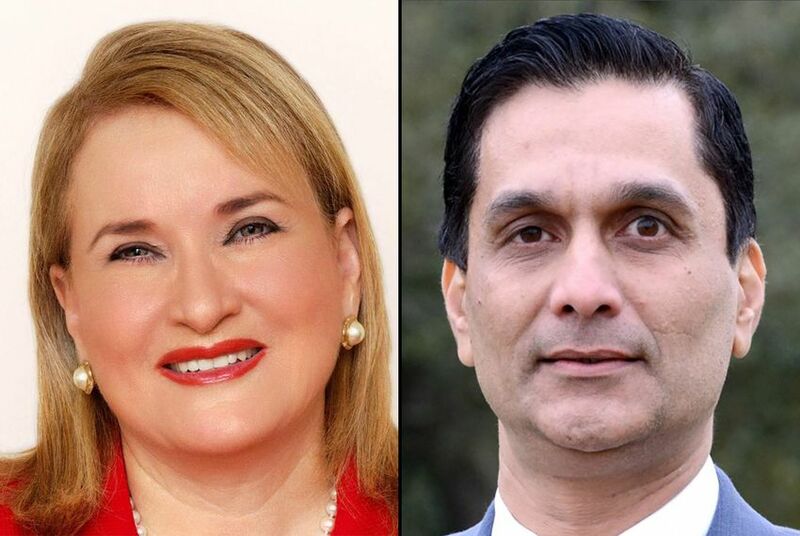 The wildcard appears to be Tahir Javed, an outspoken healthcare executive who told the Tribune that he will “spend whatever it takes" to win the seat U.S. Rep. Gene Green, D-Houston, is giving up after 25 years. “I have invested in people all my life, and I want to do it one more time," said Javed, CEO of Riceland Healthcare. “We take nothing for granted,” Garcia said in an interview. “We keep working like everyone of our opponents are not first-time candidates, but seasoned candidates. We’re ready. We’re confident we are going to win, and we are going to win without a runoff." The Texas 29th District is a mostly Hispanic district that encompasses eastern and northern Houston. Much of the population is working class, and the refineries are a major source of employment. The district's election history suggests Democrats will hold the seat in the fall, meaning the primary will all-but-certainly determine the next member of Congress. Seven Democrats are running for the seat – three of whom have the last name Garcia. Along with Sylvia Garcia and Javed, businesswoman Dominique Garcia, attorney Roel Garcia, educator Hector Morales and Augustine Reyes, a realtor, are on the ballot. It's been Garcia's dream to serve in Congress since the early 1990s. She first ran in 1992 – the original “Year of the Woman" – and placed third behind Green and Ben Reyes. Since then, Garcia served in a succession of offices: a chief judge on the Houston Municipal Court System, Houston city controller, Harris County commissioner. In 2013, she won her state Senate seat. The room was stunned, per Garcia, as attendees "dropped our forks." "I never thought I would hear Gene Green utter those words," she said. "It just kind of gelled together, and I thought, 'I can do this.'" But Garcia quickly cleared the field as a succession of potential rivals backed off, including state Reps. Carol Alvarado, Ana Hernandez and Armando Walle, all Houston Democrats. Beto Cardenas, a politically connected attorney in Houston, so seriously considered a run for the seat that he commissioned a poll of the district. He ultimately opted to stay out of the race and donated money to Garcia’s campaign. “She has very high favorability with likely votes (in the Democratic primary) and is well-linked to all core issues with Democrats," Cardenas said. “Other candidates will need to spend heavily to introduce themselves to voters, drive up negatives in opponents and connect in core issues within the Democratic primary." As a member of Congress, Garcia said the top issues on her mind would be immigration and education. She also hopes to fill Green's slot on the Energy and Commerce Committee. Few candidates come to a Congressional race with the breadth of local and national endorsements that Garcia has racked. Locally, she's drawn the backing of over a dozen local unions, including two AFL-CIO chapters, dozens of members of local city councils, multiple state legislators and former Houston Mayor Annise Parker. Last Friday, she earned the endorsement of EMILY’s List, a powerful organization that supports female Democratic women candidates who support abortion rights. The Congressional Hispanic Caucus is behind her and recently, several Democrats in the Texas Congressional delegation recently hosted a fundraiser for Garcia in Washington, D.C.. Attendees included U.S. Rep. Joe Crowley of New York – a man whom many predict could succeed House Minority Leader Nancy Pelosi as the House Democrats’ next leader. And she has the endorsement of Green, an Anglo congressman whose retail politicking style was so effective that he easily held on to the majority Hispanic district cycle after cycle. The end result is that Javed ended the quarter with $553,000 in cash on hand, compared to Garcia's $210,000 haul. Garcia's donor list is a who's who of fellow state and federal politicians, like U.S. Rep. Lloyd Doggett of Austin, Green, state Sens. José Menéndez, José Rodríguez, Kirk Watson, Royce West, John Whitmire and Judith Zaffirini, state Rep. Senfronia Thompson, and prominent Democratic donor Amber Mostyn. Javed's report revealed an interesting name in its own right: his campaign treasurer is former U.S. Rep. Nick Lampson, a Beaumont Democrat. And another Democratic notable surfaced in his sphere over the last week: Javed hosted a fundraiser last weekend for a slew of U.S. Senate candidates. The headliner? U.S. Senate Minority Leader Charles Schumer. The move on Schumer’s part annoyed more than a handful of Democrats in the House delegation who have made their preference for Garcia plain. But the larger issue of contention is that, until recently, Javed called Beaumont home. He counters that his business has led him to spending a great deal of time in Houston over the years. "I am a person who basically lives pretty much between Houston to Beaumont the whole time," he said. He also argues his business background make him uniquely able to bring health care and jobs to the 29th District, which he described as an "underserved" and "left-behind" area. “I believe we are already behind," Javed said. "I don’t think it’s right for the people of this district to wait for another two or three years [while] Sen. Garcia [serves in Congress] and then I come back and fix it four years later or two years later." “The question is, why do we let the people to suffer if we have the opportunity to get to work right now?” he added. "I’m running because this is exactly what I’ve done…I’m a health care professional who has done [a] whole bunch of times bringing the health care to the underserved areas, and I have done it very well with top-notch health care there,” Javed said. He was quick to rattle off unflattering statistics about the district. Intended or not, his negative assessments – specifically on health care - are implicit criticisms of Green, who is one of the most powerful House Democrats as the ranking member of the Energy and Commerce Subcommittee on Health. He then cited statistics of the district's poverty and high-school drop out rates. “We need to all work together, and we need to bring the leadership…we need to do it just better together,” he added. Javed said he is willing to spend big on his campaign – but declined to give a specific figure. Houston Democrats are bracing for a spending onslaught. Garcia has the name identification advantage, after decades of running for office. She said Javed's name barely registers in polling. That could all change with enough money. While a diminishing medium, television is still the most effective means to build a candidate’s name identification. Javed said a coming advertisement campaign will soon hit Houston televisions. Garcia said her focus is on block-walking and calling voters. Other wealthy Texans on the ballot this year are investing their own money in their campaigns. Most notably, in the nine-way Republican primary to replace retiring U.S. Rep. Ted Poe, R-Houston, longtime GOP fundraiser Kathaleen Wall has given her own bid a $2.7 million boost out of her own pocket. Self-funding candidates have a mixed record in Texas. Four current members of the delegation spent over a million dollars on their first races. U.S. Rep. Vicente Gonzalez, D-McAllen, spent big – $1.7 million – on his 2016 race for the 15th District. He went up on television early and had an army of field organizers. It worked. It does not always, though. U.S. Rep. Marc Veasey, D-Fort Worth, twice faced self-funders who also had demographic and geographic advantages over the now-three term congressman. But each time he beat back the opposition with a highly organized turnout operation in the Fort Worth African American community. Despite Javed's money, few know the district better than Green and he’s betting on Garcia. Amber Mostyn has been a financial supporter of The Texas Tribune, a nonprofit, nonpartisan news organization that is funded in part by donations from members, foundations and corporate sponsors. Financial supporters play no role in the Tribune's journalism. Find a complete list of them here.